While the pupils who attend the morning shift at São Jorge school listen to the radio programme with Ravel, the pupils from Pucu, who attend a later session at the same school, gather in the forest to collect bamboo. They’re taking part in the ballotbox competition to build a ballot box that looks like the huts in which they live along the River Amazon. 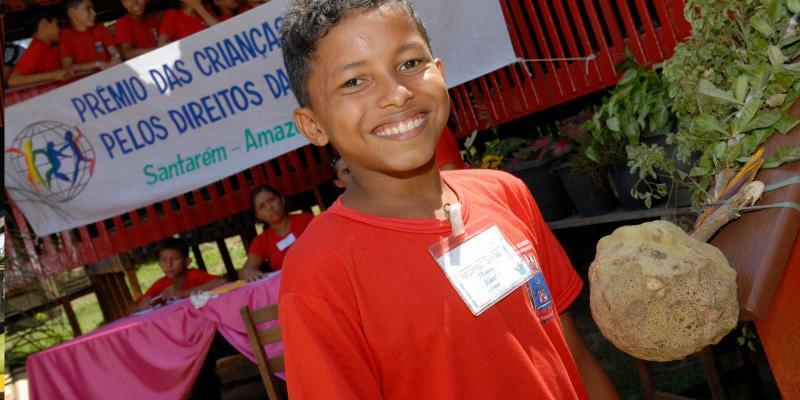 Josiane Carvalho dos Santos, 10, and her brother Josicleisson, 11, both help collect bamboo for the ballot box. Josiane is a bit impatient. She has to get to school to present the candidate who fights to free slave children and who defends their rights. “Things like that happen here in Brazil too. The situation for children needs to improve here as well. Children should be treated well and with love,” she says. Josiane and her siblings have time to play and study, but they all have to help out at home. Josiane looks after the animals – hens, goats, sheep and parrots – while Josicleisson takes care of the bees. “I have to clean the beehives so that the flies and ants are not attracted to them,” he explains. The friends take the ballotbox to school in their canoe, while Josiane and Josicleisson paddle their own canoe to school. 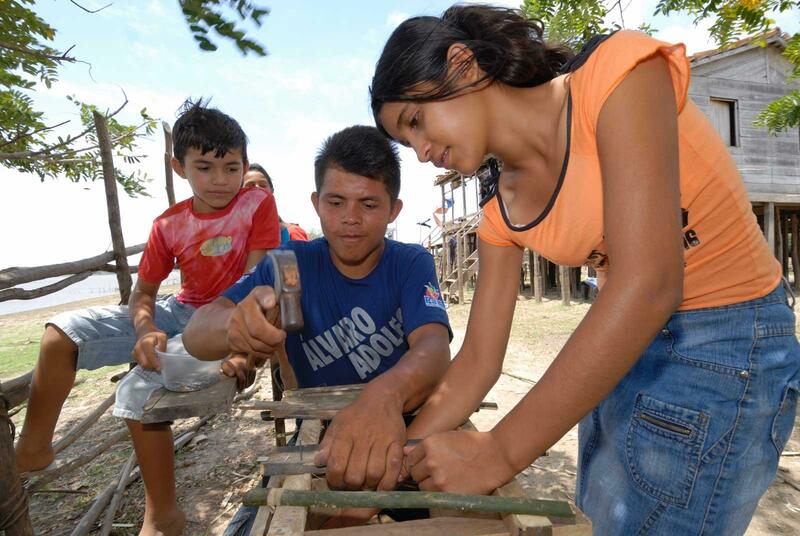 Josiane and Josicleisson paddle their canoe to São Jorgé school every day. They’ve done that on their own ever since they were six years old. The journey to school is more fun today than usual. 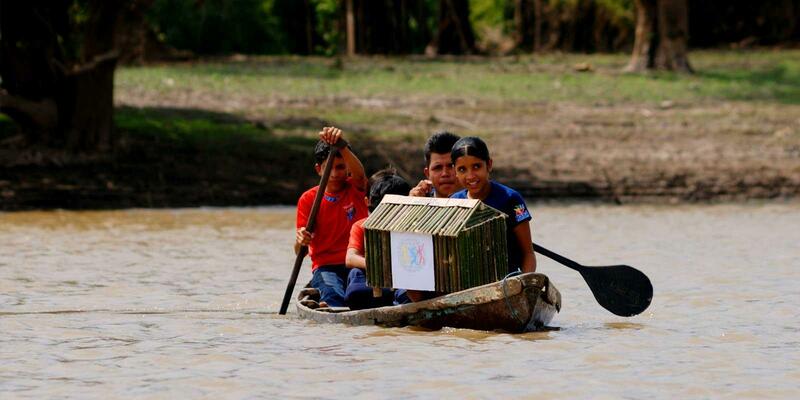 All the children in Pucu who are going to school paddle together, taking the ballotboxes they have built with them. 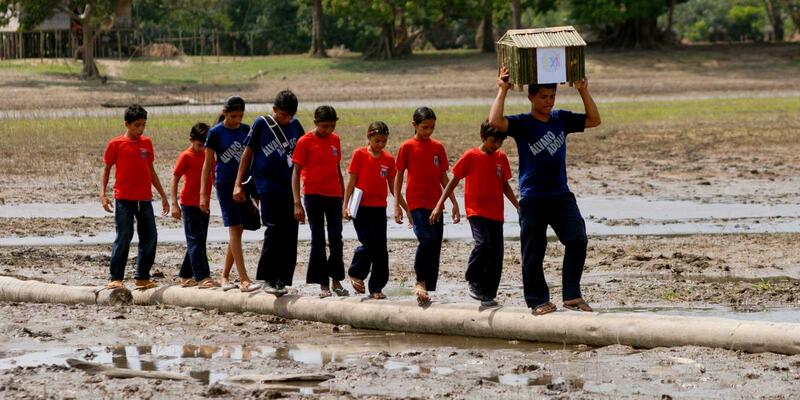 They have to go on foot on slippery logs along the wet ground for the final part of their journey to school. A single slip and they'll end up in deep mud. The pupils from Pucu meet some of their school friends from Tapará Grande on their way to school. They pick fruit and seeds and break off leafy branches. “We're going to make the school look nice for Global Vote Day,” they say. After a long journey, the Pucu children finally arrive at school. They can hear the World’s Children’s Prize band from a long way off, practising on their drums. They will round off the Global Vote Day along with the drama group, who will recite poetry and dance. The children in Pucu make their entry for the ballot box competition – a mini bamboo hut. 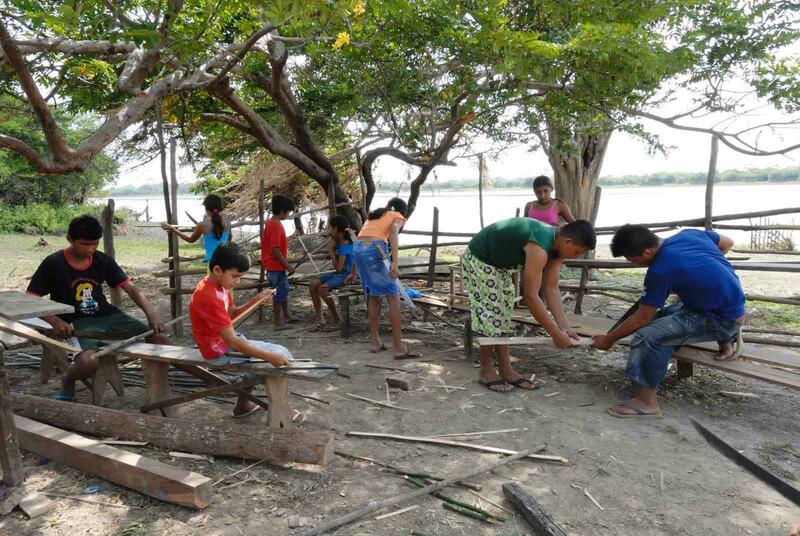 They’re taking part in the ballotbox competition to build a ballot box that looks like the huts in which they live along the River Amazon.